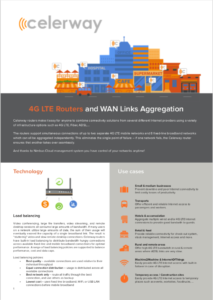 The Celerway Cirrus is a 4G LTE Router with WAN Link Aggregation, providing intelligent load balancing. It can support up to 10 VPN Tunnels, has 5 Ethernet ports, 2 SIM card slots, and it provides Wifi and GPS. 4G connectors are 4 x RP-SMA Female (2 per 4G modem) and RP-SMA Male to SMA Female adaptors are included. The Celerway Cirrus provides load-balancing throughput from 95 Mbit/s. A single VPN tunnel can get about 20-30 Mbit/s. Our measurements show that 10 tunnels can run in parallel at 3 Mbits/s each. This router has 5 ethernet ports that can be configured as either WAN or LAN. GPS is available.